The next day, it was the turn of the foulards rouges, or red scarves. Their “Republican march for the liberties” drew about 10,000 people on to the Parisian streets. The choice of red had nothing to do with the French left. Many scarf-wearers complained that the activities of the gilets jaunes prevented them from enjoying a Saturday outside or doing their shopping. Their chants were pro-police and pro-Macron. When the gilets jaunes (yellow jackets) were outnumbered on the streets of the capital by an unofficial “leave us in peace” brigade, it was a sign that the movement which started with roundabouts was at a crossroads. What were they for, what should their tactics be, and how could they keep up the levels of popular support that placed Macron so firmly on the back foot? Top of the candidates’ list is Ingrid Levavasseur, a nursing assistant and single mother from Normandy. Levavasseur became a well-known gilets jaunes spokesperson after a TV show in which she detailed her everyday financial difficulties and found she had touched a chord: “I thought I was an isolated case, but I see how everyone suffers. The nurses, the sick, the unemployed, the hauliers ...” She is not the only one to be enthusiastic about entering politics: Jacline Mouraud, whose Facebook video condemning the fuel tax went viral in November, is launching a party too. It won’t run for the European elections, but she has hopes for the 2020 local elections. But the would-be political wing is viewed with contempt by the gilets jaunes radicals, who remain devotees of a more grass roots democratic style combined with new types of protest designed to capture the imagination, such as the first “yellow night” at the weekend (a sit-in on Paris’s Place de la Republique). As the various factions contend, the danger is that the organised chaos of the early protests becomes just, well, chaos. Since the new year, the gilets jaunes have developed wildly divergent strategies. Some weekly marches are declared while others happen on the spot. Unions have joined in, and are calling for a general strike starting on February 5. The gilets jaunes have successfully shaken things up, but disarray is spreading among them too. Prominent figures are starting to organise independently. Eric Drouet, a radical who has pledged to keep the struggle on the streets, organised the “yellow night”; while Priscillia Ludosky, who has stopped working with Drouet, calls instead for peaceful marches and female-only events. In Commercy, eastern France, an “assembly of local assemblies” met up last week. They signed a common declaration of their values: A platform that was “neither racist, nor sexist or homophobic”, aimed at coordinating the movement democratically, and, pointedly, said they had no wish to run for office. The disagreements are undoubtedly endangering the movement’s momentum, which has also been damaged by occasional outbreaks of violence. Macron and others have denounced the violence of gilets jaunes “hooligans” at protests, while ignoring that inflicted by police on the protesters. Dozens of yellow vests have been injured. Last Saturday, Jerome Rodrigues, an ally of Drouet, was injured by an object allegedly thrown from police lines. In response, Drouet posted an online call for “an unprecedented uprising by all necessary means”. As spring comes, the movement, which has remained vibrant throughout the winter cold, may bring greater numbers to marches. 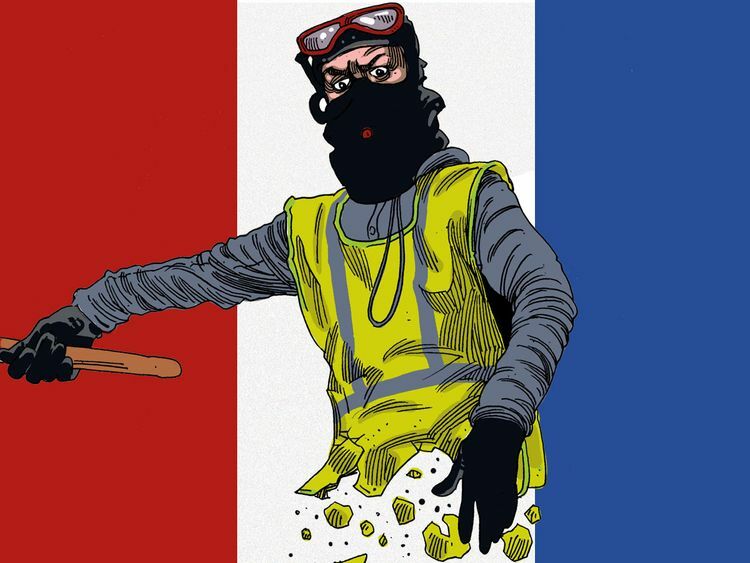 But as some of the gilets jaunes decide to pursue more orthodox political routes and the radicals fight to keep the movement non-hierarchical, decentralised and on the streets, a battle for the soul of the gilets jaunes is on the cards. Who wins it will be crucial, and not only for a movement which came out of nowhere to frighten the life out of the occupant of the Elysee. It will also decide the future course of anti-establishment politics in France. And it’s time for the gilets jaunes to decide who and what they want to be. Pauline Bock is a French journalist based in Brussels.